• ¿Quiénes tienen recursos para pagar Hackers y pretender darle legitimidad a una ley hecha para proteger a terroristas de estado? 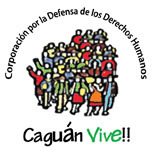 Last Friday 10th of March, the National Day in Defense of Territories, Water and Life was held. 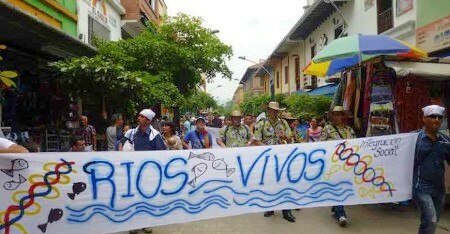 The seventh national day organized by the “Movimiento Ríos Vivos” [Live Rivers Movement] focuses on the relationship between river tributaries and peacebuilding, "because if territories are seen as commodities and rivers are dammed, it is not possible to talk about peace” explained Isabel Cristina Zuleta, spokeswoman for the organization. Zuleta said that the organization seeks to make this proposal visible, together with the Historical Memory Center, because of the need to establish a Truth Commission in the light of environmental crimes. In this way, it seeks to claim nature as a victim of the more than 50 years of armed conflict in Colombia. In Santander, Antioquia, Bogotá, Cauca, Córdoba, Huila, and other cities around the world, various activities will be carried out in the defense of rivers, against global economic interests and the development of hydroelectric projects. "Most of the rivers have been the repositories of murdered people and blood ... The city is making the Colombian countryside get sick" said Zuleta, adding that this is what environmental violence is about, since the Colombian conflict has favored the economic interests of companies that build dams and other extractive projects, which in turn, forcefully displace communities, as is currently happening with the communities that have been affected by the Hidroituango Company in Antioquia. Taking into account this relationship between rivers and peace, the activities of this seventh national day will be carried out in Transitional Zones [where FARC-EP is currently grouped], such as Briceño, Toledo and Ituango. The objective is to strengthen the community processes with an environmentalist approach, so that the community residents learn how to defend their territories from these companies. For example, according to Isabel Cristina, it has been known that companies such as Continental Gold, are already using an approach to befriend residents in a mining project in certain areas of Antioquia, so it is important to train residents to not allow companies to enter into their territories. 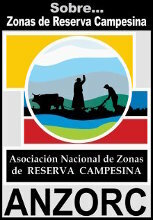 Additionally, the spokesperson for Ríos Vivos added that the activities of the national day seek to push a request to the “ANLA” (National Environmental Licensing Agency) for a public hearing to monitor the Hidroituango Company so that they consider the environmental effects on the part of EPM (Public Services Company). Particularly on the damages of the tropical dry forest, the animals and the pollution of water.